YOU WANT YOUR HOME TO BE AN ASSET, NOT A LIABILITY! When you are ready to buy or sell your home, you are about to make a significant decision for you and your family. Often, your home is one of the most important assets you will acquire in your lifetime, so you want to be sure this asset doesn’t become a liability. I will provide you with the details you need to make an informed decision about your investment in a home. I have nearly two decades’ experience in the home inspection industry, and with over 6,000 home inspections performed, I have the extensive knowledge and meticulous attention to detail you deserve in a home inspection professional. 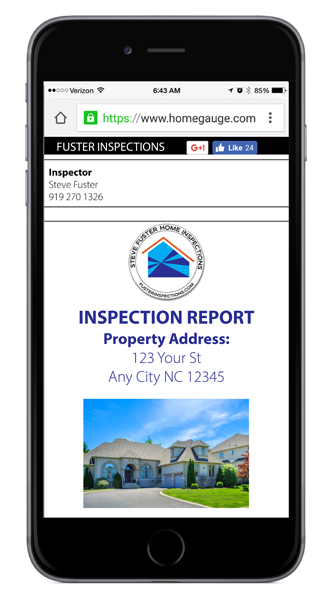 HOME INSPECTION REPORTS DELIVERED STRAIGHT TO YOUR INBOX! My comprehensive home inspections will assess all visible and accessible structures and systems of your home, from top to bottom, giving you an unbiased evaluation of the condition of your home. For your convenience, I employ cutting-edge HomeGauge software that will allow you to access your digital home inspection report within 24 hours of your inspection. My inspection report features many high-resolution photographs and detailed descriptions of my findings and a unique Create Request List (CRL). The CRL enables you to itemize any issues that need to be addressed with your contractor in a concise list before you finalize your decision. If you ever have any questions about your home inspection or the subsequent report, I am always available to discuss them with you. I want to be sure you have a valuable, clear understanding of the condition of your home and what steps are necessary. My quality home inspections give you the confidence and peace of mind you need to make the best decision to protect your treasured asset. I often get return clients, and I’d like to extend my gratitude for your continuing business with a 10% discount on my inspection services for repeat clients! Give me a call or click here to schedule your quality home inspection services from an experienced professional!